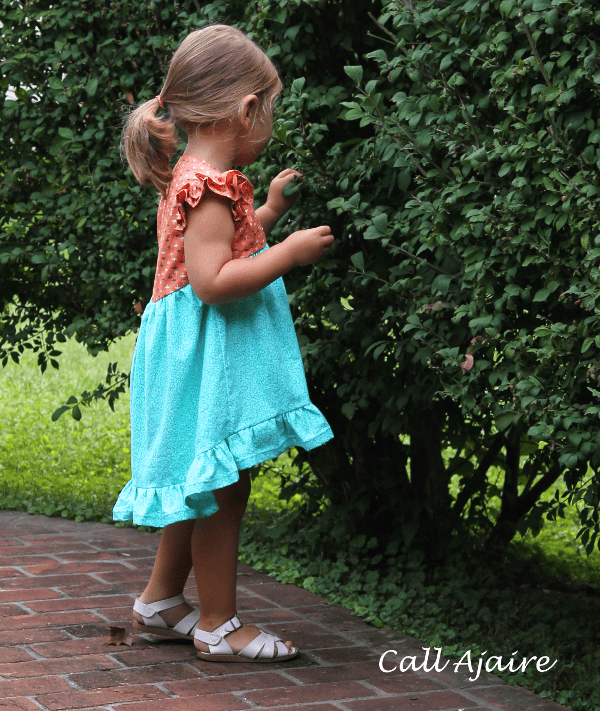 Let’s start with See Kate Sew‘s Daydream Ruffle Dress. I have had this pattern for awhile and love it. I made one for a friend’s daughter, but never got around to making one for Bean although I have intended from the beginning to use it for a MMUp. 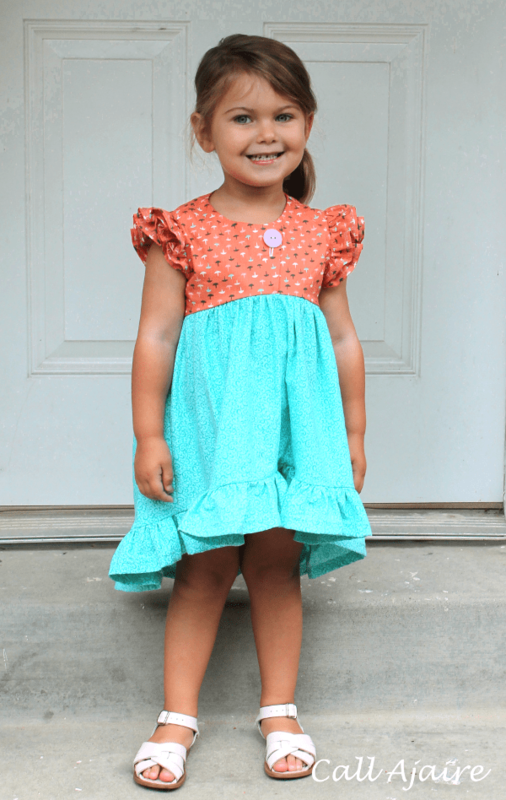 Those ruffles are enough to make any little girl happy and the cool off-center bodice makes this ruffley dress just edgy enough for even a tomboy. The high-low skirt has a way of accentuating the ruffles along the bottom when she moves which is such a smart design. The front looks billowy and cloudlike which makes it fun to look at. With only one buttonhole, I’d consider this a beginner pattern. Making all those ruffles takes some time, but it’s not difficult and totally worth it. For Bean’s I made a 3T, but the sizing runs from 12/18M to 8Y. 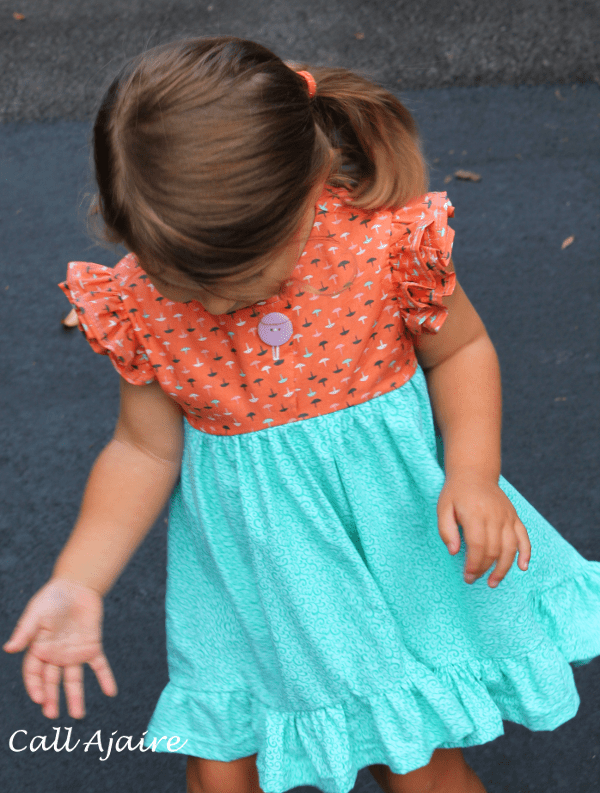 The bodice fabric is a dreamy cotton + steel cotton lawn which I bought from Imagine Gnats. I paired it with a quilting cotton to give the bottom enough heft to hold up the ruffled hem, and I love the result. 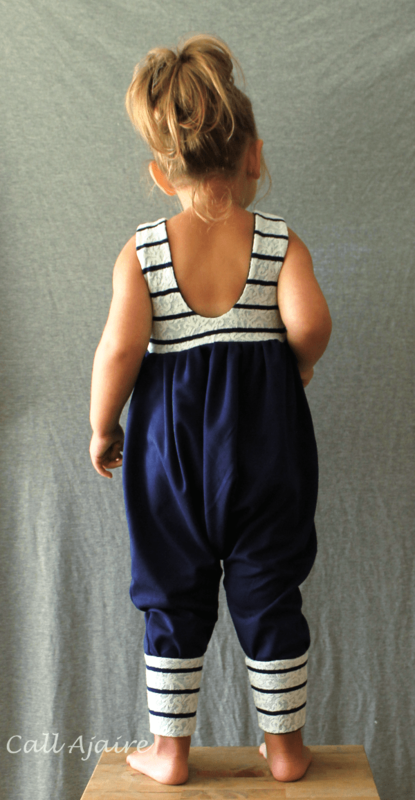 The second pattern is the new Alley Cat Romper from the Lil Luxe Collection (*affiliate links). I was a tester for this pattern and I can’t speak enough to how easy the process was. Jessica is a great designer and it shows. 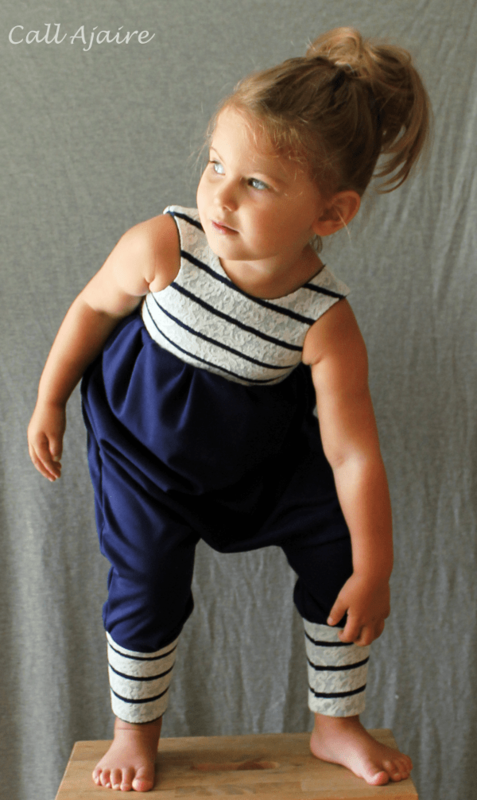 This comfortable romper is full of style and concept design, without being over the top for a children’s pattern. It’s a style I find fascinating and I truly can’t wait to see what comes next in her collection. I’ve shared this romper before, but it has been worn in constant rotation since. The back neckline slays me. It’s a gorgeous shape and even with the deep plunge, the straps stay perfectly on her shoulders. As I mentioned before, it’s easy for Bean to get it on and off for using the potty which is important to her since she wants to do everything herself. The pattern recommends using all knit, but I also made one with a knit bodice and ankle bands with the bottom using a woven rayon challis from Wanderlust Fabrics and it turned out great. This one also gets a ton of wear and I love the floral fabric. Sorry about the iPhone pic, hehe. This pattern runs from 18M to 8Y and I made Bean a 3T. The fit is perfect. 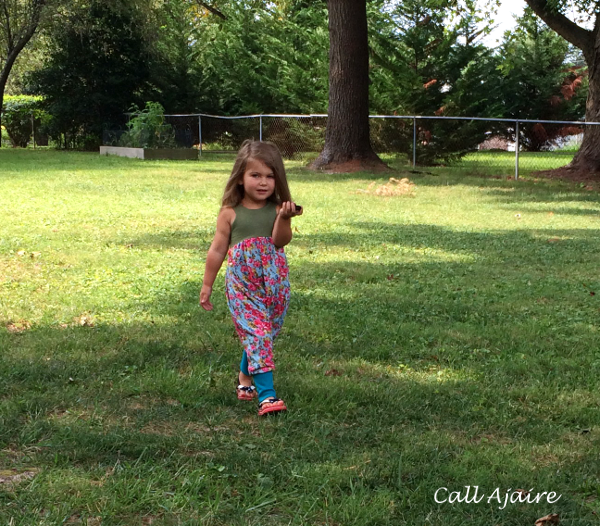 Jessica has a few tutorials on her blog for turning the romper into a dress which extends the use of the pattern as well. Next Thursday I’ll reveal the MashUp (keep an eye out this week for sneak peeks on Instagram and Facebook) and we’ll start the pattern alterations, but if you’d like to mash-a-long then first you’ll need the patterns. The Alley Cat Romper can be purchased at 20% off with the code mashup (valid through 9/17) here (*affiliate link). 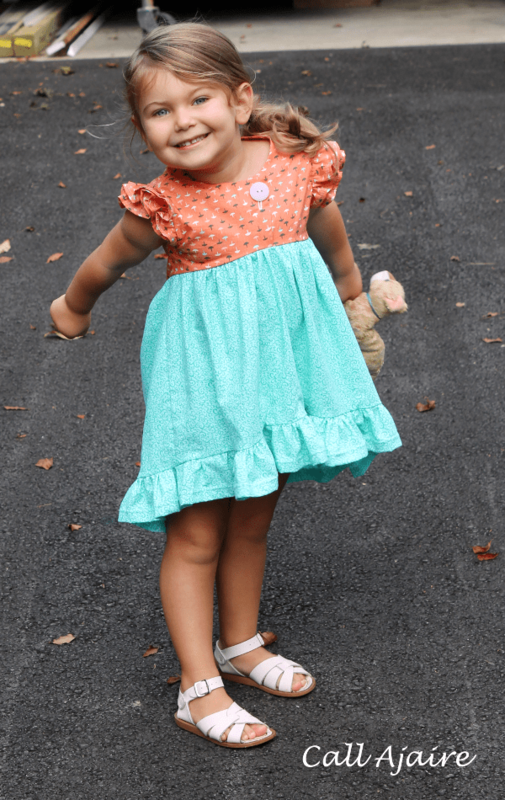 The Daydream Ruffle Dress can be purchased here. Enter the giveaway rafflecopter below for a chance to win both pdf patterns which have been generously donated by the designers.